DIY retailer Homebase is to pursue a three-year transformation plan following the success of its sister store Argos, which is digitising its in-store, online and mobile channels. Over the past year, Argos has been in the midst of a transformation plan to digitise its brand, unveiling its first digital concept store in Old Street, London, in November 2013. According to the financial results of parent company Home Retail Group, Homebase has already opened nine digital concession stores in a similar manner to Argos, with plans to open a further 10 over the next six months. In Home Retail Group’s half-year financial results ending 30 August 2014, Argos stated it now has 32 digital stores in operation after converting 13 existing stores, and plans to convert a further 10 by the end of the financial year. Argos has also trialled a number of small-format digital stores, and the retailer plans to have around 50 of these trading by Christmas 2014. The company believes market growth in digital channels will continue to outpace the retail market, and by focussing on these channels it believes it can secure further growth. Argos has also seen its online sales represent 43% of total sales, as well as sales from mobile devices increase by 45% in the past six months. In fact, 22% of its sales now come from mobile or tablet devices. Meanwhile, Homebase’s recently upgraded website has helped its multichannel sales grow by 12% year-on-year, which represents around 7% of the retailer's total sales. Sales results for both Argos and Homebase have increased overall by 2.9% and 4.1% respectively. Chief executive of Home Retail Group John Walden said the successful delivery of the Argos transformation plan over the next three years continues to be the company’s priority. “Homebase is a good business with the basis for future growth. In this context, Homebase will pursue a three-year plan through to the end of the 2018 financial year to improve the productivity of its store estate, strengthen its propositions and accelerate its digital capabilities by leveraging Argos’ investments,” he said. “This will position Homebase as a smaller but stronger business, ready for investment and growth,” he added. The results also stated plans to reduce the size of the Homebase store estate that doesn’t meet the demands of the “changing digital shopping patterns”. But Homebase plans to become more digital by expanding its concession stores and using some of the investments made by Argos, including multiplatform apps and product fulfilment. Argos has also completed its national roll-out of its hub-and-spoke network which enables same-day collection for 20,000 products. Meanwhile, it has also introduced other innovations, including voice technologies to allow staff to respond quicker to customer orders, and tablet catalogues in-store. Additionally, the retailer has implemented streamlined payment and collection, and fast-track collection of online goods in 60 seconds. Argos has also decided to expand its trial initiative with eBay, which offered around 150 stores to some of the auction site's merchants for collection purposes. The two brands have decided to expand this service to 65,000 eBay merchants with access to around 700 Argos stores for product collection. The famous Argos catalogue is also being transformed to digital with tablets in stores, as well as new versions of its Apple and Android apps, which have been downloaded a total of 10 million times since first launch. IT director Mike Sackman joined Argos in April 2012, when the retailer was reviewing its digital strategy. As IT director he is accountable for all things technology and works very closely with the chief digital officer (CDO). Sackman also sits on the executive board, so he is closely involved in the company’s business strategy. He ensures the technology strategy is always developed alongside the business strategy, rather than treated as an afterthought. Commenting on the digital transformation strategy at Argos, he told Computer Weekly it wasn’t about developing a business strategy and responding with an IT strategy, it was about developing the whole strategy at the same time. “Clearly technology has a role to play from the customer-facing end – mobile phones and tablets – all the way through to the distribution line. It’s an end-to-end technology strategy that covers the whole business,” he said. 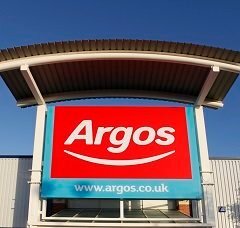 To become omni-channel, Sackman said Argos has had to merge its in-store, catalogue, online and mobile channels to offer the same experience to the customer – “irrespective of how they interact with Argos”. Now, 50% of the retailer’s business starts online. He said a lot of this growth has come from mobile, and he sees people buying tablets – often from Argos – and then using them to shop online. “We need to respond to the massive customer demand to shop differently,” he said.